My birthday dinner was a mixed bag. The older kids had alternated misbehaving and acting like angels most of the rainy afternoon. A dear friend and her daughter stopped by to drop off a gorgeous bouquet and lovely, dangly earings hand-made by the daughter. 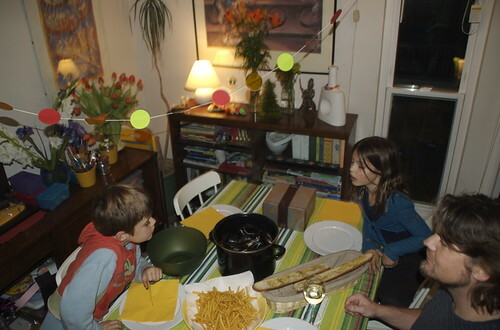 For dinner, Tomas prepared Moules Frites (mussels, steamed with white wine, shallots and garlic with a side of french fries), and an incredible garlic-bread-with-no-garlic (baguette painted with olive oil and a dusting of salt and pepper). The mussels would have been delicious had they not been so BIG. Tomas had bought some not-farm-raised variety which I think was supposed to be more ecologically correct or something. The things were enormous and I couldn’t bring myself to eat more than one. Poor guy, he really did try. Shockingly, Miss M was not grossed out at all and was ecstatic when I suggested that we might be able to make a Mussel Chowder with the left-overs (there were plenty). Hanging above the table is my present to myself — a garland of paper circles in red, lime-green and gold. I’d finally tracked down a nice-sized circle-cutter this weekend and went to town cutting & gluing my circles on to kitchen string on Sunday afternoon. It looks very pretty in person. I’m thinking it would be fun to make more with different sized circles and other shapes.